In Cocaine Blues, the first novel of Kerry Greenwood’s rip-roaring mystery series set in 1920s Melbourne Australia, we are introduced to the fabulous world of the Honourable Phryne Fisher. Not only is Phryne Fisher a preeminent female gumshoe of the flapper era, she solves crimes with panache and in high fashion while driving fast flashy cars and flying airplanes. Furthermore, she lives her personal life and pursues love interests to the fullest according to her own rules – shockingly for the time – in a manner parallel to that of some of her rough-shaven hard-boiled male contemporaries. This sets her apart from many other female detectives who are often shadowed by self-doubt or questioning. And quite frankly, this is what makes Phryne Fisher such a fun and fascinating heroine to read about. Cocaine Blues opens with Phryne attending yet another stuffy dinner party in England. When the lights go out and the chandelier diamond necklace of one of the guests suddenly goes missing, Phryne makes short work of identifying the thief and finding the jewels. Impressed by her no-nonsense prowess, an older couple attending the party asks her to determine what is wrong with their daughter, Lydia Andrews, who is living in Australia with a less than ideal husband and inexplicably suffering frequent ailments. Phryne takes the opportunity to return to Australia, as England had become very boring after the War anyway. Phryne had spent her childhood in Melbourne in abject poverty. She and her father had left for Europe when her father had suddenly come into an English title. As a result of her difficult childhood, Phryne maintains an intense empathy for the impoverished and hard on their luck – a proletariat sense of justice if you will. Upon her arrival in Melbourne she quickly amasses a colorful cadre of friends and compatriots. There is Dot, her secretary and companion, a housemaid she rescues on a promenade just as she is about to assault the manhandling son of her previous employer. Instead of allowing the distraught girl to get herself in trouble with the authorities, Phryne deftly humiliates the young man by cutting his suspenders and getting him arrested for public exposure. Then there are Cec and Bert, a good-hearted cab driving pair that are always up for a good day’s work and have an ever-guiding sense of what is right and just. Cec loves and cares for stray cats and anyone and anything that is down on its luck. Bert is a bit rougher around the edges and preaches equal rights for the masses. Another friend, Dr. Elizabeth MacMillan, is one of the first female physicians. She dresses as a man and chooses to live in a masculine fashion, while caring for women whose problems the medical profession of the time preferred to avoid. Also making an appearance in this novel is Sasha de Lisse, a handsome and seductive modernist Russian dancer. Phryne takes him for a lover, and has no faint-hearted qualms about it as would typical female characters of the day. Phryne enjoys her passionate but purely physical enjoyment with Sasha immensely, and clearly takes the driver’s seat in the relationship. She even single-handedly rescues him from a pair of thugs that attack him one night. Sasha, his grandmother, and his sister ask Phryne to help them track down the “King of Snow”, who has come to Australia from Europe along with a lucrative cocaine trade. Phryne thus has two mysteries on her plate, which, in an unexpected twist, end up being more intertwined that one could guess. The Phryne Fisher books have attracted a wide audience of readers who appreciate a different type of female detective – one who is whip smart, thoroughly modern, and enjoys herself without guilt or hesitation. I’d whole-heartedly recommend these books to anyone looking for a fun, entertaining and clever mystery. 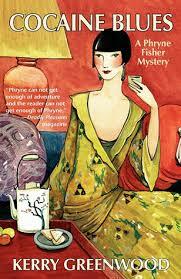 One cannot go wrong with Phryne Fisher! This entry was posted in Female Gumshoes. Bookmark the permalink.